Sometimes giving feedback to a company can really make a big difference. I learned this one time years ago when I replied to a question on a website for one of my favorite restaurants at the time, Chipotle. The question was something like, "Do you know of a location where we should build a new restaurant?" Now at the time, the closest Chipotle to my house was a good 20 minutes away; not super far, but not exactly close either. Also around this time they were building a new shopping center near by and there were a bunch of openings for new stores. I thought, "Hey, wouldn't it be nice if the put a Chipotle in there?" So I went ahead and put in the suggestion for the new location. I didn't actually expect them to take my advice, but it was worth a few minutes of time just for a chance. I don't remember if I got a reply back; maybe an automatic reply stating something along the lines of, "Thank you for your suggestion. Our team will look into this location..." So months went on and I forgot about it. But then something amazing happened. I was driving by the new shopping center and guess what sign had just gone up? 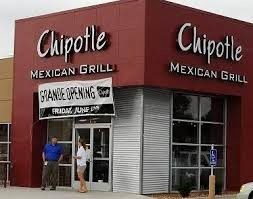 "Coming Soon - Chipotle Mexican Grill"! I was shocked and excited! They actually must have read my email, looked into the location and decided it was indeed a good place to open a new restaurant. I was going around telling everyone how I had recommended they put a restaurant there and then they actually did! It was so nice to be able to drive only a couple minutes instead of 20 minutes to get to one of my favorite restaurants. Sometimes it pays to take the time out of your day to give feedback to businesses because they actually do listen and might make big moves based on what you have to say!